While bloodsports like dogfighting and cockfighting have been outlawed nationwide, thousands of native carnivores and other species—including bobcats, coyotes, crows, foxes, marmots, mountain lions, prairie dogs, rabbits, and raccoons—perish every year in killing contests across the country. In these barbaric events, contestants win prizes based on certain criteria, such as killing the greatest number or the largest of the targeted species. Baseless Myths: Participants justify their killing by adhering to an outdated prejudice against target wildlife species that is rooted in fear and misunderstanding. Animals historically viewed as vermin are common victims of killing contests because there are almost no laws protecting them. Counterproductive to Sound Wildlife Management: Mass killing of native carnivores disregards the critical role that these species play in healthy ecosystems and creates chaos in the family structures of the targeted species, which may result in increased conflicts with livestock, pets, and people. Gratuitous Violence: Most of the animals killed in these contests are not used for their meat—they are merely seen as a life to kill and their carcasses are dumped after the events. A 2018 undercover investigation by the Humane Society of the United States showed wildlife killing contest participants piling up coyotes and foxes they had killed to be judged for prizes, and laughing and posing for photos in front of the dead animals. In many contests, young children are encouraged to participate, and hunting equipment and high-powered rifles—including AR-15s—are awarded as raffle prizes. Violation of the Public Trust Doctrine: This doctrine is a foundational judicial principle mandating that governments hold natural assets, including wildlife, in trust for the general public and future generations—not for exploitation by the few. In fact, killing contests are counterproductive to sound wildlife management. They can create instability and social chaos in the family structures of the animals who are killed, often leaving orphaned young to die and killing the experienced individuals who would pass down appropriate hunting behavior and knowledge to younger animals. Left on their own, adolescent animals are more likely to prey on livestock to survive. Read a statement in opposition to coyote killing contests signed by more than 70 world-renowned conservation scientists here. Wildlife killing contests are legal in almost every state, but Americans are increasingly demanding an end to this bloodsport as they learn about cruel and counterproductive wildlife killing events. Statewide Level: California outlawed the awarding of prizes and inducements for killing non-game mammals and furbearers (including bobcats, coyotes, foxes, and raccoons) as part of a contest, derby, or tournament in 2014, setting a precedent for the nation. Vermont banned coyote killing contests in 2018 and Maryland passed a moratorium on cownose ray killing contests in 2017. Strong momentum is building in New Mexico and other states to end wildlife killing contests in 2019. City and County Level: In 2018, the city council of Albuquerque, New Mexico, unanimously passed a resolution calling for a statewide ban on coyote killing contests and the town council of Dewey-Humboldt passed a resolution condemning wildlife killing contests. The city of Tucson and Pima County in Arizona passed similar resolutions in recent years. Litigation: In response to a legal complaint filed by conservation organizations, in 2014 the Bureau of Land Management canceled a permit allowing an anti-wolf organization to conduct a multi-year “predator derby” on more than 3 million acres of public lands in Idaho. Conservation groups also shut down an annual coyote hunting contest in Oregon after hard-fought litigation. Ask your state legislators (find your lawmakers here) to ban wildlife killing contests. Call, send letters, and meet with them in person. You can find a legislative information packet here. Ask your state’s wildlife management agency to ban wildlife killing contests. Call, send letters (submit letters here), and meet with them in person. Encourage your city or county council to pass a resolution (condemning wildlife killing contests and urging the state legislature to ban the bloodsport statewide) or an ordinance (banning wildlife killing contests in the city or county). For guidance on passing resolutions and ordinances, see an advocacy toolkit here and/or email info@projectcoyote.org. Host a screening of Project Coyote’s award-winning documentary KILLING GAMES ~ Wildlife In The Crosshairs and invite stakeholders to attend. Write letters to the editor of your newspaper to raise awareness about killing contests and encourage readers to express their opposition to their lawmakers. For tips and tools to writing letters to the editor click here, and for sample letters, go here. Educate your friends, neighbors, colleagues, and the general public by disseminating information about wildlife killing contests and what we each can do to help end them. Use this informational postcard at tabling events and ask people to fill out this blank postcard to send to their policymakers. For sample social media posts, go here. Shut down individual contests in your state by firmly, but politely, urging the event hosts and sponsors to stop supporting killing for fun and prizes. Find sample letters to hosts/sponsors here. Donate your time and/or financial support to wildlife protection organizations working to end wildlife killing contests. Wildlife Killing Contests: A Guide to Ending the Blood Sport in Your Community by the Humane Society of the United States. This toolkit guides you to raise public awareness, shut down individual events, and pass laws to ban killing contests. It includes sample letters to the editor; op-eds; letters to event sponsors and hosts; social media items; factsheets; testimony; and letters to policymakers. 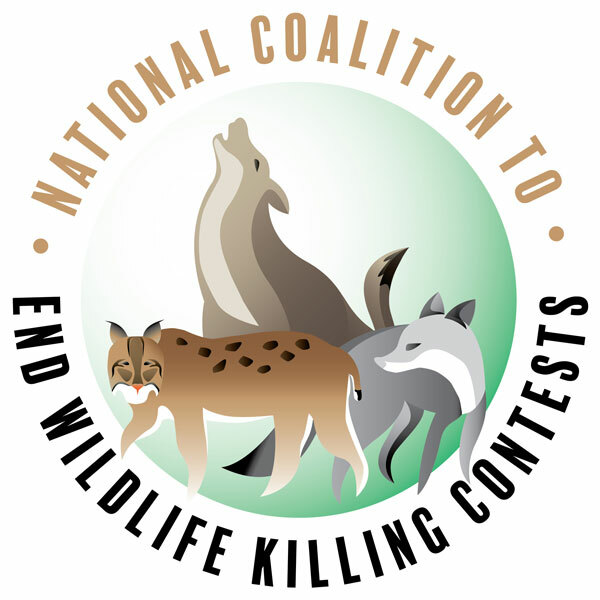 Project Coyote’s award-winning documentary KILLING GAMES ~ Wildlife In The Crosshairs exposes wildlife killing contests. Watch the trailer, see upcoming screenings, and apply to host a screening here. The Humane Society of the United States’ 2018 undercover investigation of wildlife killing contests (more info. here). Better Off Alive: Why it’s time to end senseless wildlife killing contests. All Animals: September-October 2018. Vermont Enacts H.636, Banning Coyote Killing Contests in the State. May 23, 2018. Albuquerque City Council UNANIMOUSLY Supports Resolution Condemning Coyote Killing Contests! Mar. 6, 2018. California bans wildlife-killing contests. Dec. 5, 2014. Paula MacKay. The Coyote Champion: A conversation with compassionate conservationist Camilla Fox. Wildlands Network: Oct. 24, 2018. Sam Schipani. 13 Unlucky Animals That Are Killed for Fun. Sierra Club: June 23, 2018. Alexi Horowitz-Ghazi. Coyote in the crosshairs. NPR: June 10, 2018. Ted Williams. Coyote Carnage: The Gruesome Truth about Wildlife Killing Contests. Yale Environment 360: May 22, 2018. James Cromwell. Why are we waging war on coyotes? Newsweek: Mar. 25, 2017. Editorial Board. Slaughtering Illinois coyotes in contest hunts is poor sport.Chicago Tribune: Feb. 21, 2017. Dave Parson and Dan Flores. Reader View: Coyote-killing contests in the Land of Enchantment. Santa Fe New Mexican: Feb. 4, 2017. Bridget Huber. These Gory New Hunting Competitions Have Taken the Country by Storm. Mother Jones: Mar. 10, 2015. Laura Zuckerman. Nearly 40,000 oppose Idaho wolf-hunting contest. Reuters: Oct. 28, 2014.